Van Gogh, depicted by the remarkable actor/songwriter-singer Jacques Dutronc (Godard’s Sauve qui peut (la vie)), has arrived at Auvers-sur-Oise to come under the care of Dr. Gachet (Gérard Séty) for his nervous agitation. Soon after the arrival of Vincent’s brother Théo (Bernard Le Coq) and his wife, plein air portraiture and conviviality give way to the more crepuscular moods of brothels and cabarets, and the painter’s anguished existence, tossing between money worries and an impassioned relationship with the doctor’s teenage daughter, finally meets its terminal scene. 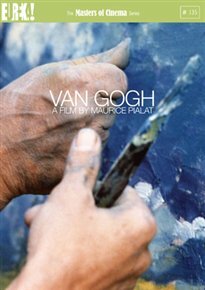 With its loosely factual and wholly inspired treatment of the last period of Van Gogh’s life, Pialat’s film applies an impressionist touch to the biographical picture — indeed, the filmmaker was himself an accomplished painter, and the personal resonance of the subject matter results in an epic, major late work. The Masters of Cinema Series is proud to present Maurice Pialat’s Van Gogh on Blu-ray for the first time in the UK, and also in a special two-disc DVD edition. • 32-PAGE BOOKLET containing a new and exclusive essay by critic, filmmaker, and performer Sabrina Marques; Jean-Luc Godard’s letter to Pialat after seeing the film upon its initial release; excerpts from a lengthy 1991 interview with Maurice Pialat about the film; images of Pialat’s canvasses; and rare archival imagery.